Taking this Global Health and Physiology course is one of the best decisions I have made in my college career thus far. This course and my time abroad in Belize has allowed me to gain an entirely new perspective on medicine and patient care. Not only do I have much more respect and appreciation for the level of advanced medicine we have here in the States, but also I have discovered a newfound passion for traveling abroad to assist those who need it. While I believe my medical work greatly impacted the people of Belize in a positive way, they helped me more than I ever thought possible. The culture of Belize is so beautiful and I have never felt such strong hospitality, gratitude, and overall kindness in a group of people before. During house visits and clinical time I was lucky enough to spend some quality time with a lot of my patients. I learned how much a patient just appreciates being listened to, and “I believe you” goes a long way. When you treat the patient like a person and not like a medical case, the quality of care improves drastically. I learned to stop just listening to signs and symptoms and started to pay attention to my patient’s feelings, body language, and things beyond their medical complaints. Adjusting to cultural differences and the language barrier proved to be very challenging, but was also very humbling. The “struggles” we experienced were so miniscule compared to those we saw the people living in these communities going through. This made me really appreciate the opportunity I was given and allowed me to focus all of my energy on doing my best work. Overall, this experience has caused me to grow both as a person and a health care provider and I am extremely grateful. Throughout this course, global health has been the main focus. In the beginning, the definition of global health and the role that I played in it were both very obscure and vague ideas. While global health is still too big of a topic to define specifically, I believe I have a much clearer idea of what it is now. Global health is the research, study, and efforts made to assist people all over the world in terms of healthcare and medicine. It involves using a multitude of resources and education to improve the quality of life by preventing and treating diseases, epidemics, and addressing any health crises. Global Health is everywhere, not just in developing countries. It encompasses many people coming together to benefit a population as a whole in regards to health and medicine. It also can be just letting the communities that you’re serving know that you care and are trying to help. Not everyone can solve a global health crisis or cure a disease. However, the effort and care alone can positively change the mindset of people who are struggling immensely. My role in global health is contributing as much as I can with the resources I have access to. I believe my strongest role in global health at this moment is going to be education. I can use my knowledge of health care to teach people not only about medicine, but preventative medicine techniques as well! I am still only an undergraduate so there is little that I can do on the actual medicine part right now, but teaching proper hygiene techniques and healthy diet/exercise can go a long way. This kind of education has the goal of maintaining long-term results because if we can teach one family about proper handwashing, maybe they will teach their friends and their children will grow up with these new standards for hygiene. Based on my experiences in this class, the biggest challenge to solving global health problems is accessibility. In Belize, public health care is free. However, the reality is that many people are living in such remote locations that they don’t have a feasible way to get to the place that provides the free health care. Not only that, but there are not enough health care facilities and they are often overcrowded and people do not want to wait hours in the hospital. If we could make more health care centers, and make them more accessible, I believe people would take advantage of them more. This could also increase patient adherence to treatment and medication. If a patient gets a 30-day supply of blood pressure medication, the unfortunate reality is usually they will not get that medication refilled unless a medical group comes around again. This is very frustrating from a health care prospective because you want to give them all that you have, but you have so many patients that also need the medicine, you can’t. I believe that an effective solution to the problem of accessibility is not going to be a simple one. However, I had one idea that could improve the accessibility of health care for those living in remote areas. My idea involves creating a form of public transportation, like a bus system, that is subsidized by the government. They would run through all of the smaller villages and take people to and from the hospital at different times throughout the day so that those who need monthly checkups or medication could get there. In terms of cost, it is much cheaper to do preventative medicine than emergency medicine, so the overall cost of this public bus would be much cheaper in the long run if people aren’t going to the hospital for medical emergencies that could’ve been prevented. Hopefully, if there was a specific bus that took them only to and from the hospital, it would be a lot more effective and easier for people to get the care that they need and would increase patient adherence to their medication. Looking back, there are a few things I wish I had done differently. First off, I would not have gone swimming in the Corozal Bay if I knew that I would get an ear infection! That is a given, but I was questioning whether or not I should have swam in it to begin with, and I definitely wouldn’t have knowing what I know now. Second, I would practice my Spanish more before going. I knew I was pretty good at speaking Spanish, which I was, but my understanding definitely lacked. I didn’t do much practice with the listening portion of Spanish before I left and it was difficult to understand what people were saying at times. I believe I could’ve connected even more with the patients if I had a better understanding of the native Spanish language because I could’ve made more small-talk while we were waiting for the doctor. I don’t have much else that I would have done differently because honestly, my experience was amazing. I truly believe I got out of it as much as I could have and I soaked in every second. I was told to “live in the moment” before I left and I most definitely did that. In terms of lasting impacts for me, this course will most definitely influence me for years to come. 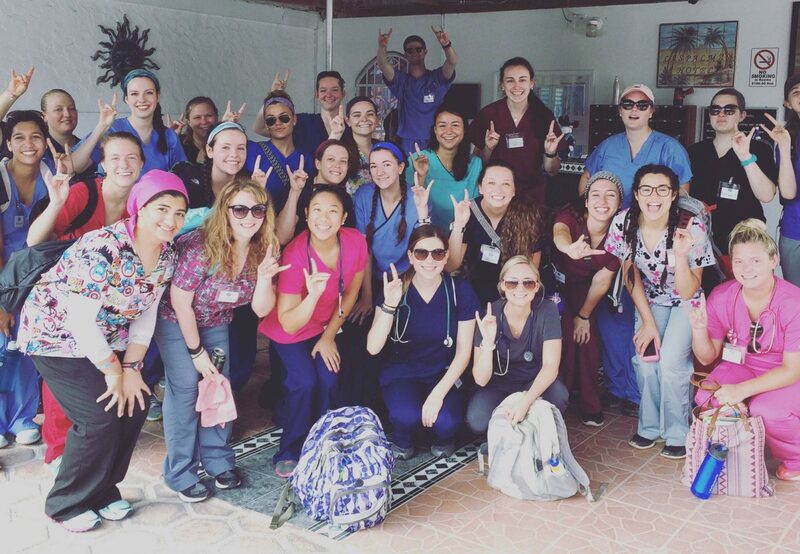 I had such an incredible experience in Belize and it completely reinforced my love for health care. I connected so deeply with all of the patients I saw and each of their stories humbled and inspired me. I will always think of these patients and their experiences when I am working as an EMT or a PA, and never lose sight of what really matters. It is easy to get wrapped up in small things that don’t matter but when you have an experience like I did in Belize, it puts into perspective what is really important. In terms of lasting impacts on the people of Belize, I would like to think that we did have a strong impact on them. I hope that our work restored their faith in health care and doctors and that our medical work helped them. I believe that our education on hygiene and preventative medicine is sustainable and something that they can continue doing for years to come. If we helped even one person and make a lasting impact on them, then I consider this trip a huge success. I want to thank everyone who had a part in giving me this incredible opportunity. My medical work in Belize is something that I will take with me for the rest of my health care career, and I believe it has truly changed me for the better!